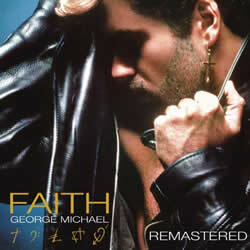 Faith was written by George Michael - singer, songwriter & record producer. Released: Oct 6, 1987 from the album of the same name. Please Note: You can play the song using all open chords, all barre chords or a mixture of both. Due to the strum pattern which includes muffling the strings, it is easier to achieve the effect with barre chords, although an accomplished player can achieve the same effect with open chords. Charts below include open chords & barre chords. Born: Georgios Kyriacos Panayiotou on June 25, 1963 in East Finchley, London, England. Died: Dec 25, 2016 (aged 53) in Goring-on-Thames, Oxfordshire, England. Past Associations: Wham!, Boogie Box High, Aretha Franklin, Elton John, Whitney Houston, Mary J. Blige, Mutya, and Queen. GEORGE MICHAEL chords and lyrics are property and copyright of their owners. "Faith" chords and lyrics are provided for educational purposes and personal use only.